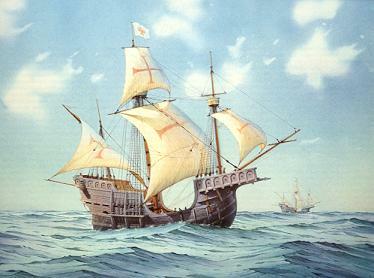 The first image that I receive as I connect with John’s energy, is that of a small seafaring vessel around the 1600’s, similar to that of a caravel, or a carrack. I am not familiar with technical terms or names of ships in this period, but these would be the terms I would use. This ship is large enough that it can navigate high sea, it has separate captain’s quarters for example, however it’s not much larger than that. It’s relatively small. This ship has mostly a French crew. There is a prisoner aboard this ship, also French, kept in an area of the ship’s hold. I got the name “Bartholomew”, so I assume this is the person’s first name (or its French equivalent in the period). Bartholomew is a past-life of John. The prisoner is lying against the wall, held by both of his wrists with chains and similar metal devices, which in turn are strictly attached to the wall with no leeway for him to move his hands. His wrists are held at waist level of a standing person, however he is sitting down, which means that his hands are held together above his head and the rest of his body. Bartholomew is extremely skinny and frail, very weak, barely able to move, held in a position of absolute vulnerability, and submission. He is completely naked, with the exception of a cloth fabric around his waist, and extremely dirty. The beard is unkept and gown. This image is eerily similar to the common image of Jesus in the cross, suffering, that is present in most traditional religious figures related to the Catholic Church. There is no-one close enough to Bartholomew for him to speak to during this voyage. If there were other prisoners, they were either too far, or too weak to speak loudly. He is alone in this situation, save perhaps for an animal or two, also present in the hold of the ship. In one or two occasions, a crew member would come by to leave some leftover food in a plate on the floor, however at no point is he allowed out of his chains or his position, so unless someone would put food in his mouth directly, it was near impossible for him to eat. For all effects and purposes, he is practically without eating or drinking. During the time that I see this image, I feel extremely cold and physically uncomfortable. This is the main experience related to this memory. Furthermore, there is a very clear sense that Bartholomew is seen and treated “below human”, so to speak. He is totally dependent of others for food (and anything else). Unless he would beg desperately for food or water, and/or show signs of being nearly dying, no-one would care to help him. He was (barely) kept alive for the voyage. There is therefore a memory of no-one caring. Bartholomew is a prisoner. He was a beggar, and he was caught stealing. He is in his mid-thirties, or the equivalent of that today – he might have been younger, but his energy and body are very worn out. He was caught stealing (possibly food, or basic utensils like clothing or tools) in a populated area near the coastline of northern France. He was jailed, and he was sentenced to forced labor in an area in Holland. The forced labor would be about lifting rocks, or bricks (I see large rectangular stone blocks) for example in a quarry, or a location where construction materials would be created. The ship that is carrying him is running errands along the northern sea area, roughly between France and Holland, which is very active as a trade passageway at this time. One of the errands of the ship is leaving this prisoner at the forced labor site, where he was to be transferred to – however it wasn’t the only errand of the ship. Bartholomew is kept aboard the ship, in these subhuman conditions, for around 5 days. His “sentence”, however, did not involve a court, or any kind of formality or due legal process. The energy I get is that he was completely alone, had no family to account for, and someone in charge of the prison, (a captain of the military or royal guard) simply decided what to do with him, without any kind of regard or satisfaction. They barely even told him what was happening. He was left in the dark the whole time, as if he didn’t matter at all. He was, not in an official sense, but for all intents and purposes, a slave. When John seems to have to insist, push, and do a great deal of effort, to have other people do things that are mostly for John’s own benefit. People around him may seem to react angrily, or in a distant manner, when they’re asked something, to do something, or when John is in need of their services. People just seem to be pushed in order to do something. One could say people react to John in a defensive way, with “ill will”, or an unwillingness to provide – even it’s in their fair and just power to do these things, even if it’s within their reach, within their role, or within their power. This may manifest within close family, but it would be more about strangers, people in general services (such as in a store, a coffee shop, etc), or in work or business relationships. That is to say, not close family, but non-emotional kinds of connections. There should be general physical sensation of cold, and discomfort, that is prevalent and ever-present in John’s life in some way. Maybe John is sensitive to cold weather; maybe there’s always difficulty getting warm, even inside the house, when in warm clothes, or inside bed’s clothing. Maybe there is sensitivity to cold (the seasonal sickness), some form of allergy, or otherwise some condition that corresponds to frailty and sensitivity to the elements, in a physical sense. This would correspond to the memory of suffering in that specific boat voyage, and to being extremely poor and homeless. The sea area of north of France can get extremely cold and damp, and Bartholomew suffered greatly with that as he was without clothes and felt very weak and chilly. There may be a definite feeling of ever not having quite enough, in terms of money and resources. There may be a tendency to “count the spare change” and pay close attention to what things cost and to monitor expenses, a feeling and situation which never quite seems to go away. There isn’t the feeling of having enough money to “breathe”. Even if there is enough money to go around, even if there is a good amount of abundance in this sense, the subtle sensation of lack and “making ends meet” (having just enough money to pay for one’s needs) will still be there. This is a memory related to being extremely poor, homeless, and begging, which is still active in an energetic sense. In a family environment, there may be the tendency to be supportive by carrying the weights of others, because John is used to being unappreciated by default, and is trying to be of value to loved ones. There may also be a tendency to, despite doing so – and for the same reason – to be overlooked and unappreciated, even if it’s done unintentionally. People seem to forget. This happens because of the following point. The memory of Bartholomew left a big toll on John: regardless of the specific area of life, there is the permanent feeling of having a very small value as a person, compared to others, or maybe even none at all. Others around John may have a tendency to forget that he exists, or that he matters. A pervading and crushing feeling of loneliness. This is due to a life of being completely alone, extremely poor, and basically having literally no value as a person for all intents and purposes. Even as he was sent to a sentence or punishment, no-one cared to speak clearly what was to happen to him. He was barely kept alive just so he could reach its destination alive, almost like livestock. This is the memory of being treated inhumanly. Further along this reading, explanation will be provided on why this specific life happened, why is it still active and affecting John’s life, and how will it be healed. For the moment, however, I would like to state the remaining of Bartholomew’s life. Bartholomew did arrive at the Dutch arbor alive, and was then allocated to his labor site. These weren’t comfortable circumstances, but it wasn’t the extreme situation he lived by being aboard the ship. There were other prisoners, and also the guards and managers overlooking the labor site. He wasn’t completely alone, and because of this, he recovered somewhat. At least, he wasn’t begging and surviving on his own. Because of this, his spirits (as in his mood, his outlook in life) recovered. There was one specific time in his life, possibly 2-3 years in the future, when he felt better enough, that he decided, in a even of introspection, to pick himself up. He tried to inject faith in himself, energize himself, and believe his life could be better some way. He decided to show God (according to his religious beliefs at the time) that he wanted to live, and that he trusted that, at some point, he would be taken to a different and better life situation. Again, it wasn’t an “easy” life by any stretch of imagination. But because Bartholomew was among many others equal to him, he didn’t felt alone anymore. It was the first time ever that he felt this. This was enough for him to get stronger and raise his spirits. He was a prisoner among prisoners, and he was doing work that was more or less useful, i.e. constructive. John helping with family and resources today, comes from this memory of doing something constructive for the first time. Some of John’s family members are those jailers and quarry managers. He is doing service to them, as authority figures, who might have an unconscious tendency to overlook him. Bartholomew was in a place that was somehow better than everything else he had known, and for that reason found strength inside to uplift himself. And by doing so, he became over time a leader figure to the other prisoners. They looked up to him, because he had made himself happy (by feeling useful and not alone) and uplifted, despite their grim circumstances. The other inmates started looking up to him in search of comfort, in the middle of their own despair, sickness, and vulnerability. Like them, he had been invisible, worthless, and useless. He had gone though all of their struggles. But in the middle of all of that, he managed to have hope, and in turn that gave them hope. He gave them a glimmer of Light. And the more he did so, more inmates would look for him, and respect him. And in turn, the more this happened, the more fulfilled he felt. It started subtly and slowly, and it then grew. And at no point did he want to blame the law, their jailers, captors, or authority figures. He didn’t see his authority figures as tyrannical or deserving of anger – as it would probably be the natural tendency of other inmates. He didn’t complain. All he wanted was to feel that joy in his service. Happiness is a powerful Light that cannot be ignored by human beings. How can a man still feel joyful and light in the presence of so much suffering done to him? Bartholomew had found something inside him, that previously not even he know about. He had found joy in in service, comradeship in the presence of oppression, and the warmth of validation, when all he had known before was loneliness and fear. There was something special about that man. At some point some inmates began speaking among themselves that Bartholomew was almost like the saints and religious figures of old. The suffering martyr that had found liberation and forgiveness for its captors. Some comparisons were even more specific, of course. We are talking about the figure of Jesus the Christ, to whom his thin bearded figure was very much alike (compared to the drawings in the scriptures and religious work). And the Light he had found was very real. The problem now, was of a different kind. Now he wasn’t as “invisible” as he was before. By expressing himself more, by displaying more courage and upliftment towards life, and by offering encouragement to the remaining prisoners – one that wasn’t confrontational, but uplifting – he had made himself visible: not only to his equals, but also the authority. The management of the labor location was not keen about Bartholomew. They wanted a weakened, frail, easily controllable rabble, that would keep in line and produce as much labor as possible while offering little resistance – and with little upkeep. But, of course, the more the spirits of the inmates grew, the farther away reality became of this. Over time prisoners began resisting small orders, and questioning the working-to-the-last-grasp. Human Spirit can’t be contained once it’s fueled. They were still no more than ragged working slaves, but they were beginning to resist being handled by animals. The truly tricky issue began when this questioning extended within authority itself. Some of those who used the whip and the chains, who stand guard and keep order, those who mended and took care of the prisoners’ health, and especially, those who were responsible for carrying out and enforcing orders, were beginning to be moved by the figure of the joyful prisoner who had abandoned hatred and found “God”. The problem with this, is that it contested the principle of highest possible efficiency and production at the expense of prisoners. Orders were sometimes no longer carried out to the last breath, to the last health, to the last life, with disregard for life. For some, prisoners weren’t livestock: they were men. Suddenly, profit was being questioned, in a very practical way. Objectives weren’t being pursued relentlessly – much like big corporations would attempt to do today. And at the very first hints and signals of this, alarm bells went off in the CEO’s office. Whispers and comparisons with saints and Jesus himself did not help. This was a very big deal back then, as religion (and, shall we say, superstition) was even more important than currently today, it had even more power in the hearts and minds of men. This was what made it an issue. This was what was feared. As silently and suddenly as it could possibly be done, Bartholomew was killed. It was ordered by those in charge of the quarry. Someone was tasked of going into the prisoners compound, and swiftly find Bartholomew in a corner. It wasn’t a prisoner who did so. It was one of the staff who still “sided” with authority and viewed prisoners as below humans. The blade went inside at the lower back, right side, and in the lower abdomen, left side (the attacker used their right hand, from up close). Today, this memory may manifest as pain in John’s body in the areas specified, or with some kind of affliction or condition that generates pain – for example, back injuries, kidney stone, or similar situations, that will create an acute sense of pain in or around those areas. I also see that today there is a figure in close family to Bartholomew related to this incident. It’s the daughter figure, which is more of an adult today than actually a “child”. She was a person, in Bartholomew’s life, belonging to the role of authority in the quarry. She has been in close proximity to John in later lives (family, relationships, and business partnerships), but nevertheless always with a similar, subtle energy of authority over John. In his very last moment, Bartholomew was completely and utterly caught by surprise. He did not see this coming, at all. It hadn’t cross his mind. Bartholomew though he was helping the quarry by working as best as he could. He never had refused to work, and never resisted authority. He never had wanted to. All he did, was to allow himself to be visible again, to feel useful, and to experience his new found joy. Furthermore, he thought God would absolutely protecting him from anything, as a reward for his faith and joy. It didn’t cross his mind that there could be a problem. He didn’t realize that the prisoners were only ever to be considered as assets by authority. He did not blame the authority figures in the quarry for his attack: he attributed it to God’s intent. Having come fresh from a traumatic situation of great pain, having lived all of his life in suffering and invisibility, he felt that the moment he finally had felt joy and happiness, he was immediately, utterly annihilated – “squashed like a bug” – like if the hand of God himself had fallen on Earth keep him silent, reduced to nothing. He felt punished. And with this final thought, in a spiritual sense – including after death, and in later lives – he returned to feeling below human again. This memory created the additional, added fear of death (or that something very bad happens) if John ever tries to be himself, if he ever dares becoming visible, relevant, or happy. This is the unconscious belief that still holds this memory in place. It also created the fear of physical proximity. Having been alone all of his life, the last thing Bartholomew remembered was the close proximity of his attacker’s body, it’s odor, what his senses perceived, and so forth. So it was engraved in him the association with close proximity to someone with the pain and sorrow of that moment. This may manifest in some way today, either as fear of proximity in general, or with specific persons in his life. This adds still to the memory of loneliness. Loneliness and “invisibility” are unpleasant conditions, but they are as if maintained by John out of fear of something even worse happening. These memories may have been greater in the past and having become quite reduced ans John’s life advances. This is because parts of the memory have subsided. This is also why John is now ready to receive this information. We will now offer clarification about the events surrounding this memory, which has been very active in John’s life. We will go through each element of this explanation as carefully and thoroughly as possible. This is important, because John has not been aware of the information we are about to explain. He may not consciously remember Bartholomew’s life, but the energetic memory of it is very active in him. However, the majority of the following information is completely new to him, even in a spiritual sense. It is therefore very important for John to receive this, for the purposes of understanding and healing of this memory. In the life immediately prior to Bartholomew’s, John was a pirate. He was a member of a pirate ship and crew, who sailed approximately in the same seas of northern Europe, stretching from Spain to Holland. He and the crew were Spanish. I receive the name “Romeo”, so I assume this was his name (or the equivalent in Spanish at the time period). He was in his 20s and had lighter, maybe blonde-ish, long and curly hair. He was young, somewhat naive, but very energetic, impulsive, and reckless. The image I see is that Romeo was an extremely angry figure, especially towards whatever prisoners the pirate ship happen to take. Romeo never actually took anyone’s life while fighting during his own pirate life; but he would fit the opposite role of Bartholomew’s jailers in his journey from France to Holland. His rage was directed, mostly, at his father figure earlier in life. I feel that his father was alcoholic and extremely violent, who beat him and his family. This was one of the reasons he had gone into a life of piracy, and why he had so much rage within him. I have a clear image that once, during a pirate raid or sacking, the pirate ship had a civilian family as prisoners, a married couple and their small son. I see that the purpose of this was to get ransom, or something along those lines. I see that these prisoners were relatively well-dressed and important. These people were treated awfully by Romeo, who was one of those in charge of taking care of them. Romeo treated them as if it’s their own fault that they were caught, and almost for his own misfortunes. Romeo withheld food and water from them, sometimes beat them, and made them suffer without any real reason, almost purely out senseless evil, out of his rage. The young child, around 6-12 years old, eventually dies out of this mistreatment, and of undernourishment and weakness. This wakened a -vague, but definite- sense of guilt on Romeo, who realized on some level that he had gone too far. It didn’t make him repent completely of his ways, but it prepared him for what was about to happen next. The next image that I see is pirate-related activity. The Spanish pirate ship had attacked another ship, as was about to pull next to it to board it. During boarding, a crew is to perform something similar to a “charge” in battle: all crew members rush at once to the opposing ship, in order to neutralize the defending crew as fast as possible. The moment the boarding command is given, Romeo raises up, along with the rest of his crew, and is about to leap to the enemy ship. But as he does so, he is immediately pierced in the chest with a firearm projectile, shot by someone in the defending crew. The defending crew in the invaded ship were expecting this exact move, and were to shoot indiscriminately at the mass of invading pirates. So the shot wasn’t aimed specifically at Romeo – but he was fatally wounded nonetheless. As he is shot, Romeo halts. He is there standing up, on the edge of his own ship, and he realizes it’s fatal. The following lasts for about 3-4 seconds, but it’s an eternity. He is standing straight, and he sees all other pirate crew members rush forward to the opposing ship. He was clearly and visibly wounded gravely. Yet he realizes that not one of his own pirate companions once look sideways to check up on him. In this moment he realizes something it was there all along: they don’t care about him. He realizes that, even while in a pirate crew, he had really been alone the whole time. There was no caring, or companionship, around him, at all. Only anger, brutality, and greed. It was the only thing (those) pirates cared about. There was only violence, a violence that was directed towards others. In front of him, a scene of blood and carnage, as both crews shoot and stab each other, lives ending up close. Not a special effects or a movie’s romanticized piracy, but a brutal, indiscriminate application of murder. For the sake of money. As Romeo is falling backwards, he realizes all of it was wrong. He had been totally wrong. The anger, his anger, his violence, the atrocities he had committed and pain he caused – in particular to that family. He realizes, that all he really ever wanted, was to be loved. In order to explain what happens next, we need to provide a short explanation on the ‘Density’ concept used by Nuno. Think ‘Density’ as in the comparative density of solids, liquids, and gases – but for the energy ou a Soul. As the gas is less dense than the liquid, so can the “density” of a Soul or energy be lighter than another, being therefore at a higher stage, or level, above. Nuno uses a system of “Densities” to explain the different stages of evolution and learning of a Soul. So when we say “3D”, the number 3 refers to the 3rd level, and the letter D stands for the word Density: 3rd Density. Likewise, 4D stands for 4th Density, and so forth. There is a specific point in time, along the evolution of a Soul, where there’s a definite graduation, or transition: from a system of beliefs about fear, violence, anger, and greed, to the realization of love and compassion. This is the graduation from 3D to 4D. 3D is the level of awareness that doesn’t mind causing pain to another being if it satisfies its interests. It sees no reason or value not to, and may contemplate reasons to do so. It’s the “survival of the fittest”. It rewards the strongest and most courageous, while penalizing the weak. It tolerates war and violent action in certain circumstances and for specific reasons, good or bad. It’s when one asks: “If there is no God, why should one actually care if I am nice or bad to somebody else?” 3D it’s the level of the mental and egoic desire, regardless of emotion or feeling. This level of awareness can both be “good” and “bad”, but nevertheless it can generate a great degree of violence, trauma, and pain. 4D is the level of awareness that the Soul reaches when it realizes that hurting others is wrong, because it’s wrong. It no longer admits violent action, for whatever reason or motive. It has gained the sensitivity that, regardless of mental beliefs or circumstances, it cannot inflict pain to others, simply because at some level it has understood that it’s actually causing pain to itself. It is reluctant to cause suffering to others, for a reason that is not logical, but heart-based. When a human being transitions from 3D to 4D, it opens up the energy of the 4th chakra, the heart chakra: the energy of Love, compassion, and the “energetic” recognition that All Beings Are One. That is 4D. It might not be realized with the mind or reason, but it is known that it is so. It is “acquired”. This was what happened to Romeo as he died, and as he passed into the realms between-lives. He got that his ways of violence and anger were wrong. He realized the nature of Love. The life of Romeo was an important landmark: it was John’s transition to 4D. His ending would be the catalyst for this transition. Pirates would psyche themselves up before their boarding – but being shot by a random bullet, without taking any part in the action, and being completely ignored by his fellow pirates, completely bursted Romeo’s “bubble”, so to speak. The utter vulnerability made him feel completely meaningless and dismissed – and the impact of this allowed for the energy of his realization to come in. An energy he had opened the door to, when he repented causing the death of the young boy. Some spiritual part of him felt his ending as a total invalidation from God. For the superstition of humans in these times, in their quests for glory, fame and wealth, is that God, or Gods, or fortune, to “be on their side”. It’s the difference of the army general somehow winning against all odds, and everything going wrong. It’s the “mojo”, the “magic touch”, the “favor of the Gods”. And it’s the difference between the famed pirate legend dodging all bullets, and being shot and killed at the first meaningless attempt. But Romeo’s end was indeed an invalidation from Spirit. We wouldn’t let him take any more lives of other humans (3D awareness): because his Soul was ready for his transition. Romeo’s spiritual belief systems, as most Europeans those days, were heavily influenced by Christianity. If we were to appear to him as Hindu Divinity figures, or as swirling balls of colored electric energy, he would probably freak out – or worse still, not be able to see us at all. Consciousness is only able to see that which it believes, or is ready to believe. So, in order for Romeo (John) to see us, we presented ourselves as typical christian figures of Angels and Saints, with halos of light above our heads, and feathery wings on our backs. We brought him, at first in an horizontal position, to what he perceived as Heaven: long-stretching, smooth, prairies with the greenest grass, beautiful birds singing, harps playing in the background, with a few hints of christian religious symbols, such as the cross, and a church, here and there. We wanted to reveal ourselves, we wanted him to clearly see us, because he was now able to. He had entered the realm of God. It was an extremely intense moment of joy and celebration. In the midst of celebration, however, there was also much sorrow. John, despite moved, did not feel that he such love, such an idea of paradise, was for him – because of the awful acts he had committed, and the life he had. He also felt very sad. It was also to address this that we presented ourselves. At this point we need to offer a brief explanation about karma. The concept of karma does not exist explicitly in Christianity. However, the idea that what’s done comes back to you, that “you reap as you sow”, and also the concept of “sin” by which you are judged after death, transmit the notion that your actions may have some implication or consequence. In a very simplistic manner, karma is the energy that is created every time you cause suffering to another being. Karma is measured by the negative emotion that was inflicted. The foundation of karma is that the suffering is not really inflicted onto the other being, but instead upon yourself – on your own Soul and energy. This is derived from the 4D realization that All Are One. The energy of karma is accumulated and “carried around” by the person that does harmful action, not by those who receive it. When someone happens to receive an act of suffering at the hands of someone, that occurs strictly to the degree that the person has itself accumulated the corresponding karma through past actions. In that sense, no harm is actually done to others: all suffering is truly self-inflicted – at least in a broad spiritual perspective. This is true for all events in life. The way Souls explore a subject or theme, is first (1) by doing, second (2) by receiving, and third (3) by healing. When an action is performed, you can’t do it and have it done to you at the same time. This is why these two roles are separated and Souls take turns in each. Imagine that you are a glass, or a mirror. Every time you cause pain or separation to the external world, you are in truth smashing yourself – the mirror. The pieces and shards of the mirror shattered by that violence, become separated from your Soul. Each of those pieces is one of your karmic attributes. Each one of the shards will need to be reintegrated within you, for you to become whole again. That is healing. The integration will involve exploring the negative emotion that originally caused the separation. Facing the negative emotion always implies feeling it, which most likely will happen by external negative situations. Each shard will attract that which originally broke it, so that it can be healed. This is why the second stage is to experience the equivalent of what was performed in the past. Nuno calls it “karma burn”. This is also why 4D is often seen as an energy, not only of Love and compassion, but also of victimization, suffering, and even martyrdom, because it follows 3D, when most negative actions that cause harm were done. The lines aren’t strictly drawn. Karma is independent of level of awareness. You can still perform negative action and accumulate further karma while already operating at 4D. However the focus has become less about causing negative action of 3D, and more about melding back its own Soul pieces through Love and acceptance, 4D. The danger of a person not going through its karma is, over time, falling back to its negative patterns. The danger of Romeo not facing its karma would be, later, to return to its pirate and violent ways (or similar). Why? Because the human spirit forgets easily over time – unless the lesson has been integrated at Soul level. When you have that “gut feeling” that you shouldn’t do something in life – when you feel you don’t want to lie, hurt another, be dishonest, or any other life choice – that’s because a karmic lesson was previously learned, through the act of performing the action first, and then experiencing the result, later. It’s going through this process that “engraves” the lesson, and prevents the Soul from falling back in awareness. This is how karma works. Romeo (John) was not at peace. Just because he had understood his lesson didn’t mean he was healed. He felt he needed to go back and correct what he had done in his previous life. This is the typical reaction of the Soul who has just arrived at 4D. There is usually great regret and sorrow, as the individual realizes just how much negative he had been to others, and a great desire is born to go back and do the right thing. This is because the Soul instinctively knows that it still needs to go though some of its karma in order to truly heal. A desire arises to compensate for past actions. Romeo felt he needed to atone for the things he had just done as a pirate in his previous life. And this matched our own understanding on how karma works. We knew he needed to do so. Not because it was right or wrong, not because he had to be punished – but because the priority was to take this opportunity to “formalize” the lesson, to “cauterize” the wound, so he would Romeo/John’s Soul be firmly in 4D in terms of awareness, without the risk of falling back afterwards. This was extremely important. Becoming aware of 4D level of consciousness, the level of Love, usually allows Souls to see us. They are now able to fully acknowledge Spirit. So Spirit is now able to plan the human’s next life alongside the human himself, instead of working largely in the background. So we asked: “Do you want to make up for it?” He, of course, passionately and humbly said yes. Now, we knew that Romeo had strong biases within his belief systems. This is important because it would heavily influence and shape the experiences he would have in his next life. First, he had a strong bias towards INCARCERATION. Primarily, because the life of a pirate is permanently haunted by the prospect of being caught by authorities. That is about the worst case scenario it can happen to a pirate. And also, because he had so many experiences being a jailer of prisoners aboard ships. So the experience of atonement, and suffering, would always revolve around being a prisoner, and jailed or incarcerated. Each Soul is drawn, and creates for itself, experiences that are related to what its most intense focus is. To what it’s closest to. Secondly, his spiritual belief systems were heavily influenced by Catholicism, and catholic saints and martyrs, and by the image of Jesus the Christ, whom by virtue of his shift in consciousness, he now related to more than ever. For him, he had just seen God. As such, we conveyed the meaning of his experience as being of his own SAINTHOOD process – because it was. We explained that all saints went through what he was about to go through: an experience where he would endure extreme suffering, where he would be put to the test, and that he had to make his best effort to forgive those who would do harm to him, and find joy, service, and hope, wherever he could. This is how we were able to explain to him what was about to happen. We explained that all Souls will go through, at some point, this experience, this test. And that he was about to be given his opportunity. He agreed. In fact, he desired to. He now loved the image of Jesus, of being like him. He now understood in his heart. As Bartholomew, being a prisoner aboard the ship was the opposite end of what he had done to other prisoners. He endured, because on a spiritual level he knew he had to. And at no point did he blame his captives. We were very proud. As a captive in the Dutch facility he found joy in service, and companionship with the other captives. Against all odds, he found hope where no hope could be found. This joy was his gift to him. It was the energy of God and Love (4D) that descended upon him as he was ready, at the quarry. This is why others slowly started to perceive him as a Saint himself. Because it was exactly what was happening to him. However, not everything went well. The image similar to Jesus in the cross, was what he had draw to his life. It was, on a spiritual level, his expectation of what was to happen to him. Because it’s how he perceived it. He modeled his expectations on the life of Jesus. There was a point, when Bartholomew was a prisoner on the ship, that the image of Jesus on the cross crossed his mind very clearly, because of how similar it was to his own situation. This is because a part of him, spiritually, expected it to happen. He was biased, tuned, towards His story. Subconsciously, Bartholomew compared his life with the life of Jesus’, and he thought his ordeal aboard the ship corresponded to his crucification. Because of this, subconsciously, he felt relieved when he got out of the ship alive. He didn’t die. He assumed the worst had passed to him. He felt light and free from that moment on (even though he wasn’t literally “free”). This is why that, when Bartholomew was killed, he was caught completely by surprise. He though that God was protecting him, assuming nothing bad could happen to him anymore. Sadly, Bartholomew’s murder was an experience taken with absolute sorrow and despair, interpreted by him as if a punishment by God. He believed that God had utterly punished him by being happy and joyful, and that doing so was a mistake. At the very end of Bartholomew’s life, the energy of sainthood, of graduation, was available to him. We made it available as he passed away. However, he didn’t realize it. His sorrow made him dismiss his whole experience at the quarry. It made him dismiss completely his joy and happiness, as well as his self-worth. For him, it was a complete mistake. Having been murdered like that, in a meaningless and dismissive way, touched his wounds too much. Yet it was that very experience that offered him the ultimate opportunity for forgiveness. It represented the extreme experience of others reacting to him in a negative manner. His own experience of “crucification”, where he could make his ultimate act of forgiveness and pass away in peace, was in fact his murder. Instead, he completely cleared from his mind the new found joy and spiritual experiences he had at the quarry. And his focus rolled back to his experience of being nothing, of feeling meaningless. This was what he believed to be fundamentally true for him. Not that he wanted, but what was his reality nonetheless. This is why the memory of being a prisoner at the ship is far stronger and more present in John’s energy, than that of the spiritual breakthroughs at the quarry. This is why the reading recovered that memory first, and much more sharply, than the memories at the Quarry, which were relatively distant. This is why there is a tendency today to be invisible and worthless, and to fear being visible and happy. Because the last time it happened, it was interpreted as a mistake. It was his very first time, the first opportunity, he would experience, at graduation, or ascension. To graduate is to leave the incarnation game altogether. We were aware, beforehand, that given John’s sensitivity and tuning with feeling worthless, irrelevant, utterly dismissed, it would be extremely unlikely that he would be able to truly accept peacefully the way he died. The potential was very low. No-one gets the first time right. It’s possible, yet not probable. 3D is a very harsh reality. Religious beliefs offered by the Catholic faith, which were the context for this life, make it easy for interpretations that favor suffering, victimization, and see events as if punishment from God. This made it difficult for Bartholomew to avoid feeling as if he we were punishing him in his last moments. Our primary priority was to bring Bartholomew definitely to a 4D awareness level. To allow him to experience the opposite end of what he had made from a 3D perspective, and take that experience in a way that was constructive to his Soul. In a way that would prevent him from ever going back to negative ways, of causing suffering to others. Even not achieving ascension itself, he did fulfill his core goals. And that was not easy either. Not everyone does so in their first attempt. Not everyone would be able to not even consider complaining and blaming his captives. And he did that flawlessly. It did not occur to him blaming anyone, at any point in time. Do you realize this? We, Spirit, have seen many things, and have steered many situations in the human experiment. We were blown away at how open John was to the energy of God – and still is to this day. We would not believe how well he truly did. John dismissed the new spiritual experiences at the quarry, because he has had ages and lifetimes of getting used to not feeling joy, enthusiasm, relevance, and liberty to himself. It would always be perceived by John as something extremely fresh and frail, almost “too good to be true”. But as his focus of awareness regressed, it did not regress up to the point of tolerating anger and violence again. It regressed to the point of being the prisoner in the ship. In other words, he might have dismissed his own sainthood, and returned to a place of being invisible – but he now would not tolerate any more violence to others, nor did it occur to him blame the perpetrators for his misfortunes in life. The lesson was firmly learned. We want to finish this reading by stating the following. John is a Soul that is extremely open to the energy of Spirit. He is extremely pious, in the sense of being in tune and sensitive with the suffering of others, and with his own humility. He recognizes immediately what is Spirit. The only thing that get in the way of John’s pure connection with God (with the Divine, with Spirit) it’s his own propensity for the devaluation of himself. He is his own foe. This, however, is a natural pattern of his Soul, and of lifetimes of undervaluation. We wish for this reading to encourage John to trust himself more, and to know that he deserved sainthood. He deserves a life of warmth, of comfort, of freedom, and of recognition – from others, and from him to himself. He deserves love, and the close proximity of loved ones. The young child in his life today was the boy in Romeo’s life. The residual memories of Romeo (the pirate) and Bartholomew (the beggar) are active in John’s energy, and this is why most people react to him with fear, or loathing, respectively. The energy carried by John awakens this response on others, especially if they also met in these past-lives. For healing to occur, John simply has to remember why others have these reactions to him, and accept them. It is nonacceptance that keeps the energy in place. He is now going to accept the feelings that the reactions of others cause on him. The fundamental energy remaining for John, is that he does deserve to be visible, and joyful, and relevant, and happy. This was not incorrect. The only thing lacking was simply his acceptance. We hope this understanding will help with this acceptance. Back then experiences of trauma had to be accepted by facing them; today this may be possible with the help of this understanding. We hope we have helped.